Tobias Mühlbauer, Wolf Rödiger, Robert Seilbeck, Angelika Reiser, Alfons Kemper, Thomas Neumann Instant Loading for Main Memory Databases Proceedings of the VLDB Endowment (PVLDB) 2013 (VLDB 2014) September 2014, Hangzhou, China. Stephan Wolf, Henrik Muehe, Alfons Kemper and Thomas Neumann An Evaluation of Strict Timestamp Ordering Concurrency Control for Main-Memory Database Systems. International Workshop on In-Memory Data Management and Analytics 2013, August 2013, Riva del Garda, Trento, Italy. Harald Lang, Viktor Leis, Martina-Cezara Albutiu, Thomas Neumann, Alfons Kemper Massively Parallel NUMA-aware Hash Joins. International Workshop on In-Memory Data Management and Analytics 2013, August 2013, Riva del Garda, Trento, Italy. Alfons Kemper und Andre Eickler Datenbanksysteme: Eine Einführung. Oldenbourg Verlag, 8. Auflage, 2011, 792 Seiten. Alfons Kemper und Martin Wimmer Übungsbuch: Datenbanksysteme Oldenbourg Verlag, 3. Auflage, 2012, 448 Seiten. Michael Seibold, Dean Jacobs, and Alfons Kemper Strict SLAs for Operational Business Intelligence 4th IEEE International Conference on Cloud Computing (CLOUD 2011) Washington DC, USA, July 4-9, 2011. 6th IEEE/IFIP International Conference on Network and Service Management, Niagara Falls, Ontario, Canada, October 25-29, 2010. 3rd IEEE International Conference on Cloud Computing, Miami, Florida, USA, July 5-10, 2010. IDAR 2010 Ph.D. Workshop, Indianapolis, Indiana, USA, June 11th, 2010. 20th IEEE/IFIP International Workshop on Distributed Systems: Operations and Management, Venice, Italy, October 27-28, 2009. VLDB 2009 Ph.D. Workshop, Lyon, France, August 24, 2009. Andreas Scholz, Christian Buckl, Irina Gaponova, Stephan Sommer, Alois Knoll, Alfons Kemper, Jörg Heuer, and Anton Schmitt. ETFA '09: 14th IEEE International Conference on Emerging Technologies and Factory Automation. IEEE, September 2009. Stephan Sommer, Andreas Scholz, Christian Buckl, Alois Knoll, Alfons Kemper, Jörg Heuer, and Anton Schmittt. FITS '09: International Workshop on the Future Internet of Things and Services - Embedded Web Services for Pervasive Devices. September 2009. INDIN '09: 7th IEEE International Conference on Industrial Informatics. IEEE, June 2009. Christian Buckl, Stephan Sommer, Andreas Scholz, Alois Knoll, Alfons Kemper, Jörg Heuer, and Anton Schmitt. SOCNE '09: The Fourth Workshop on Service Oriented Architectures in Converging Networked Environments. IEEE, May 2009. Andreas Scholz, Christian Buckl, Stephan Sommer, Alfons Kemper, Alois Knoll, Jörg Heuer, and Martin Winter. KIVS 2009: Proceedings of the Workshop on Service Oriented Computing at KIVS 2009, 2009. Oldenbourg Verlag, 7. Auflage, 2009, 718 Seiten. Oldenbourg Verlag, 2. Auflage, 2009, 437 Seiten. November 2 - 5, 2008, Quebec, Canada. September 23 - 26, 2007, London, UK, p. 205. Oldenbourg Verlag, 6. Auflage, 2006, 672 Seiten. Oldenbourg Verlag, 2006, 400 Seiten, Mai 2006. Service-Oriented Computing - ICSOC 2005: Third International Conference, Amsterdam, The Netherlands, December 12-15, 2005. Proceedings Editors: Boualem Benatallah, Fabio Casati, Paolo Traverso. Lecture Notes in Computer Science, Volume 3826 / 2005 Springer-Verlag. ISBN: 3-540-30817-2, pp. 324 - 340. Oldenbourg Verlag, 2004, 640 pages. pages 104-118, Berlin, Germany, September 2003. Springer Verlag, LNCS 2819. Datenbank Spektrum, Heft 5/2003, pages 63-66. Informatik - Forschung und Entwicklung, Band 17, Heft 3, 2002, Springer-Verlag; Seiten 123 - 134. Beitrag im Buch "Web & Datenbanken - Konzepte, Architekturen, Anwendungen"
ISBN 3-89864-189-9, Dpunkt-Verlag, Heidelberg, 2002. Kapitel 10 von Markus Keidl, Alfons Kemper, Stefan Seltzsam und Konrad Stocker. Demonstration presented on the VIII. Conference on Extending Database Technology (EDBT 2002), pages 749-752, Prague, March 2002. IEEE Computer Society, pages 309-320, San Jose, USA, February 2002.
pages 147-162, Rome, Italy, September 2001. Springer Verlag, LNCS 2193. Oldenbourg Verlag, 2001, 608 pages, München, Germany, 2001.
pages 575-584, Heidelberg, Germany, April 2001.
pages 421 - 432, Heidelberg, Germany, April 2001.
pages 183-194, Heidelberg, Germany, April 2001.
pages 107-126, Oldenburg, Germany, March 2001.
pages 247-268, Cairo, Egypt, September 2000. Invited contribution to the VLDB Jounal's special issue "Best of VLDB 99"
IEEE Trans. Knowledge and Data Engineering, Vol. 12, No. 2, pages 238-260, March/April 2000. 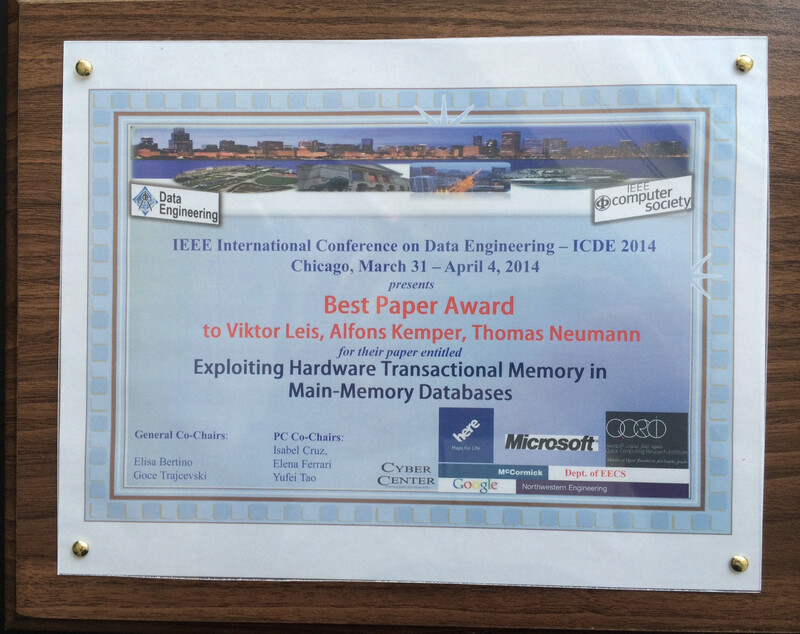 Invited Contribution to the Special Issue "Best Papers of VLDB 98"
Technical Report MIP-9909, Universität Passau, 1999. IEEE Data Engineering Bulletin, Vol. 22, No 3, September 1999. IEEE Data Engineering Bulletin, Vol. 22, No. 3, September 1999, pages 27-34. IEEE Data Engineering Bulletin, Vol. 22, No. 2, June 1999, pages 32-39. Database Patchwork on the Internet: Project Demo. pages 550-552, Philadelphia, USA, June 1999.
pages 38-58, Freiburg, Germany, March 1999. Oldenbourg Verlag, 504 pages, München, Germany, 1999. IEEE Data Engineering Bulletin, Vol. 21, No 3, September 1998.
pages 110-122, New York, USA, August 1998. Technical Report MIP-9811, Universität Passau, August 1998. Technical Report MIP-9810, Universität Passau, August 1998.
pages 158-169, New York, USA, August 1998.
page 499, Seattle, USA, June 1998.
pages 123-134, Tucson, USA, May 1997.
pages 336-345, Athens, Greece, August 1997.
pages 286-295, Athens, Greece, August 1997. Oldenbourg Verlag, 512 pages, München, Germany, 1997. IEEE Data Engineering Bulletin, Vol. 20, No. 3, September 1997, pages 12-19.
pages 219-230, Tucson, USA, May 1997.
pages 332-341, Ulm, Germany, March 1997.
pages 276-285, Athens, Greece, August 1997. Technical Report MIP-9706, Universität Passau, March 1997. On the Cost of Monitoring and Reorganization of Object Bases for Clustering. ACM SIGMOD Record, Vol. 25, Nr. 3, pages 28-33, 1996. Technical Report MIP-9615, Universität Passau, August 1996. IEEE Data Engineering Bulletin, Vol. 19, No. 4, pages 37-44, December 1996.
pages 149-160, Montreal, Canada, June 1996. Technical Report MIP-9617, Universität Passau, November 1996. Addison Wesley/ACM Press, pages 175-202, 1995. (invited paper). Adaptable Pointer Swizzling Strategies in Object Bases: Design, Realization, and Quantitative Analysis. The VLDB Journal, Vol. 4, No. 3, August 1995.
pages 228-238, Zürich, Switzerland, September 1995.
pages 18-29, Zürich, Switzerland, September 1995. Vol. 6, No. 4, pages 587-608, 1994. Prentice Hall, Englewood Cliffs, N.J., 704 pages, 1994.
pages 351-364, Cambridge, GB, March 1994 (Springer-Verlag, LNCS 779). pages 336-347, Minneapolis, May 1994.
pages 427-438, Santiago, Chile, September 1994. Addison Wesley/ACM Press, about 25 pages, 1994. (invited paper). Technical Report MIP 9412, Universität Passau, 1994. 16(2), pages 69-80, April 1993.
pages 155-162, Vienna, Austria, April 1993.
pages 543-554, Dublin, Ireland, August 1993.
pages 301-316, Chicago, USA, October 1993 (Springer-Verlag, LNCS Nr. 730). Technical Report 93-6, RWTH Aachen, June 1993. Technical Report MIP 9307, Universität Passau, September 1993. Technical Report MIP 9308, Universität Passau, December 1993. Technical Report MIP 9309, Universität Passau, December 1993. Information Systems, No. 17(2), pages 117-146, April 1992. Toronto, Canada, 25.-28. May 1992. Informatik Fachberichte Nr. 298, Springer-Verlag, January 1992.
pages 79-90, Vancouver, Canada, August 1992. IEEE Trans. Knowledge and Database Engineering, 1992. Technical Report 6/92, Fakultät für Informatik, Universität Karlsruhe, June 1992. Technical Report 92-34, RWTH Aachen, December 1992. Springer-Verlag, Lecture Notes in Computer Science #466, pages 15-33, Berlin, Nov. 1990. Informatik-Fachberichte Nr.270, Springer Verlag, pages 198-217, Kaiserslautern, Germany, March 1991.
pages 258-268, Denver, USA, May 1991. Chapter 9, pages 485-552, Marcel Dekker, Inc., New York, USA, 1990.
pages 364-374, Atlantic City, USA, May 1990.
pages 290-301, Brisbane, Australien, August 1990.
pages 281-298, Lausanne, Schweiz, October 1990. Springer-Verlag, Lecture Notes in Computer Science #466, pages 15-33, Berlin, November 1990. Welche Datenbanksysteme eignen sich für CIM? Technica, Industrie Verlag AG, Zürich, pages 27-32, Vol. 38, May 1989.
pages 19-31, Kyoto, Japan, December 1989. Computer-Aided Design, 21(6):379-392, July/August 1989. EDAPLEX: An Object-Oriented Extension of DAPLEX for Engineering Applications. pages 87-104, Informatik Fachberichte No. 171, Springer Verlag, Heidelberg, 1988.
pages 105-136, Informatik Fachberichte No. 171, Springer Verlag, Heidelberg, 1988. Vol. II: Basic Projects. Springer-Verlag, April 1988, pages 289-303. Vol. II: Basic Projects. Springer-Verlag, April 1988, pages 332-354. In: K. R. Dittrich, Hrsg., Advances in Object-Oriented Systems. Lecture Notes in Computer Science Nr. 334, pages 292-297, Springer-Verlag, 1988. Design and implementation of an extensible data base management system supporting user defined data types and functions. pages 294-305, Long Beach, USA, September 1988. ACM Computing Surveys, 19(1):47 - 91, March 1987.
pages 453-463, Kona, January 1987.
pages 344-359, Darmstadt, April 1987. Informatik Forschung und Entwicklung, 2(4):151--170, 1987.
pages 299-311, San Francisco, USA, May 1987.
pages 363 - 378, Honolulu, January 1986. NATO ASI Series, Springer Verlag, Castelvecchio Pascoli, Italien, September 1986. Robotersysteme, 1(2):177 - 187, 1986.
pages 67-83, Wien, München: Oldenbourg, September 1986. IEEE Software, 2(1):44 - 50, January 1985.
pages 67 - 81, Honolulu, January 1985. PhD thesis, Univ. of Southern California, July 1984.